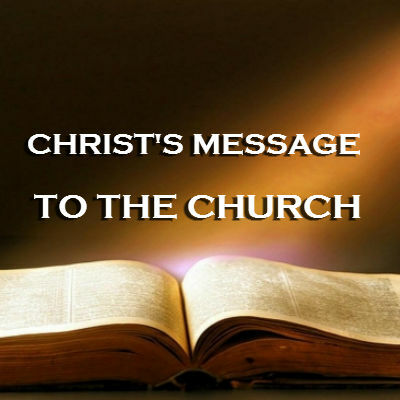 Christ’s Message to the Church! The book of Revelation is a fascinating book, it’s the only book in the Bible that promises a blessing to the readers. (Rev.1:3). Within this book we find seven letters written to seven churches in the province of Asia Minor. Why these seven? We don’t know, but the messages we find in these letters is relevant to the churches today. The church is to represent Christ in this world, but sometimes churches go through many issues and may be distracted from their main mission as Christ’s agent in the world. Through the messages Jesus sent to these churches you get to learn what God expects of his church in this world. What does Jesus expect of his church today? We find answer to this question in our study of the seven churches of Revelation. Revelation 1:10-11 Jesus told the apostle John to write what he sees and send it to those churches. Ephesus, Smyrna, Pergamum, Thyatira, Sardis, Philadelphia and Laodicea. The apostle Paul visited this church on his 2nd missionary journey. Paul spent three years there teaching and training the believers. Paul had given the elders his final instructions about keeping watch over themselves and the church. (Acts 20:28). Apparently the leadership of this church did an outstanding job guarding themselves from false teachings. About 42 years later Jesus told John to write a letter to this church which tells us how this church was doing towards the end of the first century. Each letter contains a title for Christ. John’s vision: (1:12-13) 7 golden lampstands. The Son of Man among the lampstands. (v.16) 7 stars = 7 angels or messengers of the 7 churches. Jesus is the one holding the seven angels and walking in the midst of the seven churches. These are his words to these churches. Jesus knows what is going on in the churches-He knows who you are and what you do. -Intolerant of false teachers (Jesus knew this church didn’t put up with false teachers; they had tested those who claimed to be apostles and found them false. I have this against you: (v.4)you have forsaken your first love (you have abandoned the love you had at first ESV) This church was great when it came to teaching and doctrine, hard work, perseverance under trials, but Jesus reminded them about their first love; they were not loving like they used to at first. Love is the greater commandment; Jesus had told his disciples that his followers would be identified by love. Love would be the distinct mark of his followers. When a church stops loving Jesus, then they won’t have love for one another either. Jesus had this against the Ephesian church, you have abandoned the love you had at the beginning. (v.5) Consider how far you have fallen. This was this church’s downfall. Repent and do the things you did at first. Turn to me (repent or change your purpose) and do the things you used to. Danger: If they didn’t repent, Jesus said he would remove their lampstand. This church would be removed as a beacon of life for Christ. They would no longer represent Jesus as a light bearer if they refuse to listen to Jesus’ words. (v.6) But you have this in your favor (you have this to your credit) You hate the practice of the Nicholaitans, which I also hate. The Nicholaitans taught people to compromise their faith. Their beliefs encouraged worldly participation to the point of leading people to indulge in sin. They lowered godly standard and taught people to seek pleasure. Their teaching perverted grace. The Ephesian church didn’t compromise in their beliefs. Jesus doesn’t like people who compromise their beliefs. Christians who think they can be Christians on Sunday and live as they wanted Monday and Saturday. Today you hear people playing the grace card, as if Grace doesn’t demand godly living. You are in the world, but not of it. The Ephesians got that right and Jesus commended them for it. Verse 7 He who has an ear let him hear what the Spirit says to the churches. To him who overcomes, I will give the right to eat from the tree of life, which is in the paradise of God. There is much to overcome as his church in this world. But eternal life is promised. What is the Spirit saying to us today as we look at the Ephesian church? What does Jesus expect of his church in the 21 century? Jesus expects his church in this world to be strong in his teachings, sound doctrine. One that would not tolerate compromises but stand for the truth as taught in Scriptures. Jesus’ church works hard and perseveres through trials without giving up. Jesus expects his church to be a loving community, to love God and love his people, a church that never stops loving God and loving others. The Ephesian church was great at Biblical teaching, but they had neglected their love for God. Christ’s church must be good at both, biblical teaching and their love for God. Christ is calling his church to be a conquering community. There will be lots of challenges to overcome in this world while we remain faithful to God as his light in the world. Whoever has an ear, let him hear!